In February Lancashire Music Hub has launched a series of free instrument workshops aimed at players at all levels of ability – from beginners to advanced. 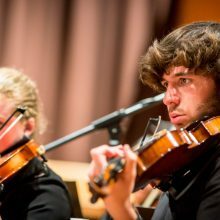 The three full day workshops in String, Woodwind and Brass will see young players from Lancashire Music Hub Ensembles join expert tutors to provide a fun and friendly day to improve participants musicianship, inspire them to play more and end the day with an informal performance for parents / carers and friends. The sessions are free and are a full day of playing and meeting like minded people. Booking is essential see the links below for more information and to book!